This last Sunday I had quite a bit of free time, but only having one show this season that airs that day, Arslan Senki, I was looking through my backlog for something to watch. Even though there are a good number of great shows in said backlog, or so I have been lead to believe, I was not feeling any of them at the time and instead decided to begin re-watching Chihayafuru, as that was what I was in the mood for. What I had intended to be just an episode or two quickly ballooned to seven and I was well and truly trapped. You may be wondering why I did not take sometime on Sunday to work on any number of articles that are in my queue. Well, it was more than 100°F in my apartment for most of the afternoon and early evening, so I did not want to do anything that required effort on my part. 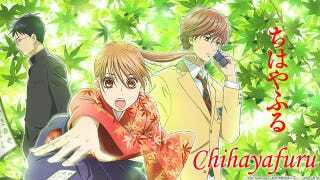 While watching Chihayafuru again I noticed that I was having a different experience than the first time through, but it was not really what I expected, so I decided to write down some of my thoughts and share them with you. Though I have titled this as Part 1 I am not sure whether there will be any additional parts. We’ll see. But I will definitely make this into a series of some sort as there are a few shows that I am planning to rewatch sometime in the near future. There will be spoilers for the first eight episodes, where I am now, of Chihayafuru in the following paragraphs, so if you have not yet seen it yet you should stop reading and go watch it now. It is available here on Crunchyroll. For those that have not watched Chihayafuru in a while, episodes one through eight cover up to the point where Nishida, whom Chihaya calls Porky, is recruited into the Karuta club. Going in I knew that I would enjoy Chihayafuru, what I did not expect was to enjoy it even more than the first time I watched it. Having already grown attached to the character through 50 episodes, 48 if you take out the two recaps, their interactions with each other and the drama that occurs to start off the story all held more meaning to me. Even little things, like Arata calling Taichi a coward in the second episode carried significantly more weight because of the events that will later transpire and how their relationship with each other changes over time. At first I had thought to just skip the first three episodes, as they ‘just’ contain the flashback to the formation of the friendship of Chihaya, Taichi and Arata, and start my viewing with Chihaya’s efforts to form the Karuta Club. I am glad I did not. These three episodes do a fantastic job of establishing our three leads as characters and for those unfamiliar with Karuta, which basically is everyone not born in Japan, provides a great introduction to a sport both beautiful and nuanced. And yes it is a sport. For Chihaya, we get to see both her no-nonsense kindness when initially interacting with Arata and the overwhelming passion she has when her mind is set singly upon a new dream. In Arata we glimpse his reclusive nature and great love for a game that he is willing to make innumerable sacrifices for, so he can become the best there is. Something that quickly comes back to haunt him, but does so realistically, as the events surrounding his grandfather’s death would cause anyone to feel guilt at their actions. Taichi comes across as an absolute brat in the early going, and deservedly so, but this is staying with his later character growth, as much of his early motivation to play Karuta is not a love of the game, but his jealousy in Chihaya’s instincts and Arata’s skill. Though still a coward in many ways, Taichi’s growth as a character over the course of the show is greater than either Chihaya’s or Arata’s and this would not be so prominent without the flashback that starts the series. Back in the present and after Chihaya’s indomitable presence pulls Arata back into the world of competitive Karuta, we get to meet the other three members of the Club that are not Chihaya or Taichi. Though the introductions of Kanade, Tsutoma and Nishida are formulaic in the strictest sense, they are so well executed that it does not matter. We may only have been given one full episode with each up to this point, but they all come across as multi-dimensional in both characterisation and purpose. No small feat. Just as with our leads, these first episodes lay a strong and lasting foundation for our supporting cast. There is a reason I like this show so much. Well this is it for now, need to get back to watching Chihayafuru and my Monday shows. And yes, the selection of images for this article was deliberate.